You wait years for a book on the interpretation of quantum physics, then two come along within a couple of months of each other. 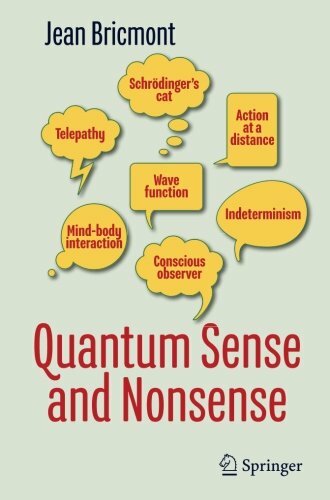 However, while both Quantum Sense and Nonsense and Philip Ball's Beyond Weird are aimed at a popular science audience (or popular sience as the back cover unfortunately categorises Jean Bricmont's book), they take a very line different. 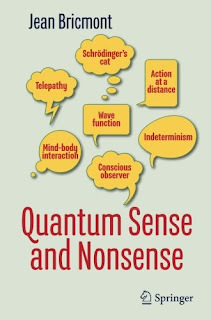 Without resorting to textbook levels of complexity, Quantum Sense and Nonsense goes into the quantum physics in considerably more depth, though at the cost of losing some readability. This is also effectively a book in three acts. The first gives us background to what the problem with interpretation of quantum physics is, goes through the Copenhagen interpretation, and introduces the oddity of the two slit experiment. This is reasonably readable. There's then a centre section that fills in a lot of detail, which is harder going. Finally, there's the most approachable part in the last two chapters where Bricmont gives us a 'revised history' of quantum physics and considers its cultural impact. What was particularly refreshing about this book is that it's the first I've ever read for a popular audience that properly explains the de Broglie-Bohm interpretation. It has to do this, as Bricmont is a relative rarity amongst physicists in being fully aware of it and supportive of it. He makes a convincing case that the interpretation was largely ignored because of Bohm's political views (he was effectively forced to leave the US for having communist leanings), and makes more sense than it is usually considered to. There were a couple of examples where Bricmont seemed to verge on cherry picking to strengthen the pro-Bohm argument. He is very critical of those who try to combine quantum physics with Eastern mystical philosophy, yet plays down the fact that Bohm also did this (which was probably as much why his interpretation was ignored as his politics). More significantly, the book paints a picture of the Copenhagen interpretation in an early form where the role of the observer and measurement is very much about experiments, rather than interaction of quantum objects with the environment. If you are familiar with this aspect of quantum interpretation it seemed significant that the word 'decoherence' only appears once, and that was in a footnote. Although it's not always the most reader-friendly text (not helped by the author repeatedly referring to himself in the plural), I would recommend this title if you want to get a distinctly different picture of quantum physics and an understanding of why, even after 80-90 years, physicists may be happy with the results of the calculations, but still can't agree on what it all really means.